The kiddie pool is a crowd pleaser - keep your camera handy. Head over after dinner and give the arcade games a whirl. Sunscreen up, grab tubes and let the afternoon drift slowly by. Switch it up between comedies and animated classics - and keep the popcorn refills coming. You're right on the beach where you can enjoy the beautiful Atlantic Ocean! Chill out as you float along the 350 foot lazy river. Enjoy a refreshing beverage, such as a margarita or a non-alcoholic smoothie, at the poolside bar. 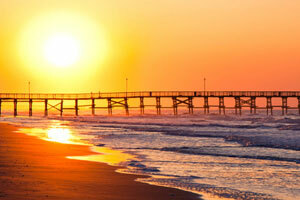 Beach Cove Resort is located in North Myrtle Beach, just a short drive from Barefoot Landing. Get your day off to the right start at Tradewinds Cafe’s daily breakfast buffet. After breakfast, head back to your condo and change into swimsuits. Grab water wings and pool toys, apply sunblock and get ready to be amazed. There are three heated outdoor pools to choose from, or alternate and use a different one each day. Grab a lounge chair and unwind with a refreshing cocktail from the poolside bar while the kids splash in the children’s pool. The indoor pool will come in handy if the weather isn’t cooperating. If you’re looking to relax, there’s a 350-foot lazy river, hot tubs and a sauna. When it’s time for lunch or if you just need a mid-afternoon pick-me-up, head to the on-site grill & coffee bar located at the resort’s Town Center. While the kids hang out in the arcade, take advantage of the on-site racquetball court or enjoy the daily happy hour at the Tipsy Turtle Beach Bar. It has ten flatscreen TVs if you want to catch the big game. One-bedroom condos sleep six guests. Good news! Your kitchenette has a full-size fridge with enough space to store everyone’s favorites. In addition to a microwave, you’ll also have a two-burner stove which gives you options. Two-bedroom condos sleep eight guests. A family field trip to the Super BI-LO Grocery Store is definitely in order – your full kitchen won’t stock itself. Recruit the kids to help bake your famous chocolate chip cookies (not that they’ll need convincing). The on-site laundry facility will be helpful for post-chocolate clean-up. Feel like having a low-key night in? You’re in luck! Your condo has Flatscreen TVs with Cable, perfect for catching a sitcom rerun. Or bring favorite movies from home to watch on your DVD player. Pop some popcorn, call everyone into the living room and get ready for family movie night. Barefoot Landing is just a short drive from the resort and offers multiple shopping and dining options. Myrtle Beach souvenirs and specialty food and candy can be found at Barefoot General Store. Del Sol features accessories and apparel that change colors when exposed to sunlight. Treat yourself to some new jewelry at A Silver Shack. Hungry? House of Blues, Wild Wing Cafe and Johnny Rockets are just a few of your dining choices. Be sure to stop by Kohr’s Family Ice Cream for dessert. If you’re up for even more shopping, head to Broadway at the Beach. The Mole Hole has collectibles and gifts, Toys & Co. will be a hit with the kids and pick up a few Yankee Candles for friends back home. Go for a ride on the Myrtle Beach SkyWheel. It’s almost two-hundred feet tall, and the climate-controlled gondolas ensure everyone can ride in comfort. Kids stay free! Children under 16 years old stay free when using existing bedding.